Last Thing To Thing Costume Plan! As promised! 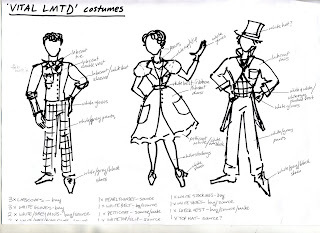 Here's the drawing of the costumes that Hanna gave me. I don't know whether I'm doing a top hat as well - I've never done anything like that. They're all providing their own shirts, pants, shoes, etc. So far I've made: Hanna's underskirt! And I've taken the sleeves off Ben's labcoat! WOO PROGRESS! I'll post pics as soon as I remember what my camera looks like. I've probably got a photo of it here somewhere. Congratulations on the progess you've made. I hope you find your camera soon, because I'm very excited to see the pics and experience the magic of your creativity.